Did you see the recent pictures of Hans and Bailey over at Furrybutts? 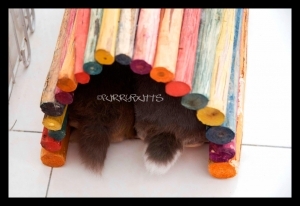 I love this picture, where only their little tails stick out of their tunnel! This entry was posted on Monday, May 25th, 2009 at 9:53 am	and is filed under Bunnies. You can follow any responses to this entry through the RSS 2.0 feed. You can leave a response, or trackback from your own site. Their tails are cute, They really seem to have a very cozy snuggling in there. Yes, those two boys are definitely best pals! Yeah.. looking at the boys’ tail make me laugh.. so cute! Oh we know those two well … a great pair, they are!! !